Khartoum: Sudanese police fired tear gas at protesters holding rallies in the capital Khartoum on Sunday after organisers called for further demonstrations against President Omar Al Bashir’s three decades of rule. Al Bashir, on a visit to Cairo to meet his Egyptian counterpart Abdul Fattah Al Sissi, said the media were exaggerating the size of the problems he faced at home. Deadly protests sparked by a government decision to raise the price of bread have rocked the east African country for weeks. The demonstrations have mushroomed into nationwide rallies against the government of Al Bashir, who swept to power in 1989 in an Islamist-backed coup. 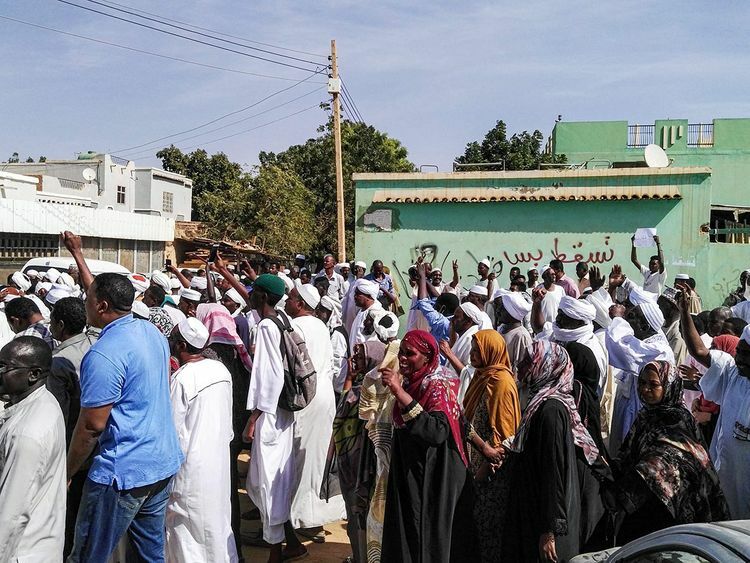 On Sunday, protesters came onto the streets in Khartoum and its twin city of Omdurman to hold sit-ins in several squares, responding to a call by the Sudanese Professionals Association which is leading the protests. But a massive deployment of riot police and security agents prevented them from gathering at several locations, witnesses said, and the protesters later began rallies in residential areas of Khartoum and Omdurman. “You’re police, you have to protect us,” demonstrators shouted as riot police cordoned off several squares in Khartoum and Omdurman, where they had planned to hold sit-ins. Police surrounded many squares and filled some with muddy water to prevent demonstrators from gathering, witnesses said. Riot police also fired tear gas at protesters trying to gather in Al Thawra district of Omdurman, and two other areas in Khartoum, witnesses said. “When we came to the square for a sit-in, we saw security forces had surrounded it,” said a female demonstrator, who did not identify herself for security reasons. The SPA had called for sit-ins on Sunday across several squares in Khartoum and Omdurman. The group, an umbrella association of doctors, engineers and teachers, has also called for simultaneous rallies across the country until Wednesday. Authorities led by the country’s National Intelligence and Security Service (NISS) have cracked down on protesters, opposition leaders, activists and journalists in a bid to prevent the spread of demonstrations. On Sunday, security forces arrested four journalists, the non-government Sudanese Journalists’ Network said. Sudan has ranked 174 out of 180 on the World Press Freedom index every year from 2015 to 2018. While bread price hikes sparked the first protests, anger has been mounting for years over growing economic hardship and deteriorating living conditions. Al Bashir has remained steadfast in rejecting calls to resign. On Sunday, he said the media were exaggerating the size of his problems. “There is a problem (in Sudan), we are not claiming that there is not. But it’s not of the size or extent raised in some media,” Al Bashir said in Cairo after meeting Al Sissi. The protests were “an attempt to clone the so-called Arab Spring in Sudan”, he said, referring to similarities between the slogans and use of social media in uprisings that hit the region in 2010-2011. Al Bashir has blamed the country’s economic woes on the United States.